Sapporo-based artist Chisato Shinya creates under the name "Kinpro". Known for bold use of colour and pattern, Kinpro's works are largely informed by both the natural world and fairy tales. "In the room of the forest" - a recent exhibition in Tokyo, was inspired by the animal life found in the forest. Kinpro's work for the show included a combination of papercuts, stencilled work, and wooden pieces. I am so enamoured with the bold colour and what feels like Scandinavian-inspired use of pattern. 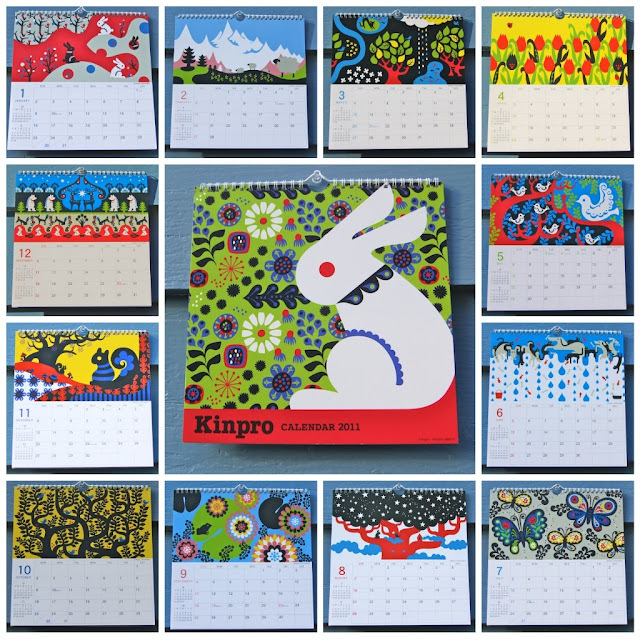 Kinpro often collaborates with various Japanese manufacturers to produce a variety of goods and housewares. Don't you wish there were some Kinpro fabrics in the works? And who wouldn't want a few of these Rabbit friends around to ring in the Year of the Rabbit? Love Kinpro? Want to bring a little into your home? Find the 2011 Kinpro Calendar Gift Set on Omiyage.ca It makes a wonderful gift this holiday season!